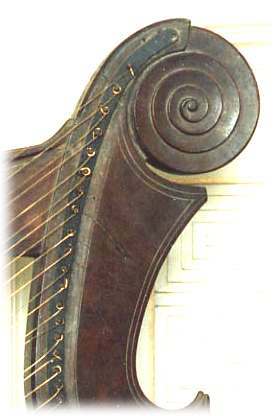 This harp was made in Ireland over 300 years ago. It is quite large and massively built, and had a range of almost 5 octaves. Though we don't know exactly when it was made, or by whom, the harp was owned and played by Cornelius O'Ffogarty (1661-1730). After his death the harp was preserved in the family. Although it is no longer kept at the family home, this harp is one of the few still in private hands.